Our newest addition is designed to withstand the rigors of multiple users for multiple hours on a daily basis. And the commercial motor will keep it running for years. Box Dimensions: 86" X 36" X 17"
The TT9 is the heaviest machines of all the Sole treadmills (approximately 50 lbs heavier). It's designed to withstand the rigors of multi users, for multiple hours, on a daily basis. Definitely a product that will stand the test of time and maintain its value for years to come. One of the main features the TT9 offers is an AC motor. This type of motor is only found in a commercial product and is considered the most reliable of motors, with the least amount of maintenance. 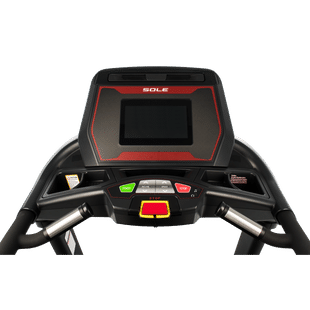 The overall goal of a Sole treadmill is to offer a machine that provides the outside runner a realistic feel to his or her regular routine run. With that in mind Sole went about designing the TT9 and came up with some very beneficial features. The TT9 now offers 2 motors that operate the incline and decline features of our treadmill. This gives the user the necessary freedom to customize their runs according to what they are accustomed to doing outside. Rather than making themselves accommodate to the machine, the user can now bring the outside workout indoors. In addition to the incline/decline feature, the extra wide running surface and reinforced framework produce the best foundation for a deck, that allows for a user capacity weight of up to 450 lbs. This framework, perma-waxed reversible deck, with 3" crowned rollers, offers any runner uncompromising quality for years and years of use. When compared to like models which cost upwards of $7,000, the Sole TT9 is miles ahead of the competition in quality, performance, and value. 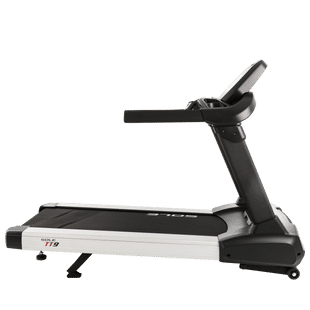 The TT9 also comes with a commercial grade multi ply belt that adds even more to the feel of the treadmill as well as longevity. The belt is engineered on a similar premise to the soles in running shoes. 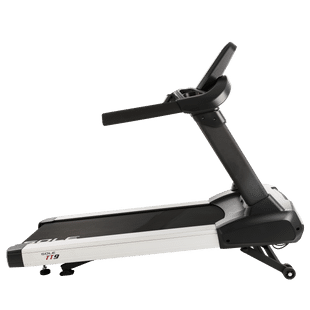 The TT9 offers a top speed of 12mph and a top incline of 15 levels to give you a variety of options for interval workouts. We also added a 10" touchscreen display allowing users the flexibility to use integrated apps or just focus on their workout. It's also equipped with a whisper quiet cushioned flex deck, and a 4.0 CHP motor with a commercial grade 10lb. flywheel around the motor to help provide a smooth and consistent power. Similar to our other treadmills you'll find the same, effective programs that will not only challenge a user to excel but will also keep them on target for reaching personal fitness goals. The Heart Rate Control program for example will keep you on target for heart rate training, whether it be for losing weight or endurance training. The TT9 is also built to be used in a light commercial setting and has a light commercial warranty in addition to a standard warranty for just basic home use, giving every user the comfort and knowledge that they are buying a superior machine at an absolute unbeatable price. It is simply the finest treadmill in the SOLE line, backed by the best warranty in the market. *The TT9 also includes blue tooth capability. Allowing users the freedom to transfer workout data from their fitness equipment to their smart device. Users can track their fitness info on the Sole app, or have their data be transferred to other compatible fitness apps. Bluetooth Technology - Sole now allows users the freedom to transfer workout data via Bluetooth, from their Sole fitness equipment to their smart device. Users can download and track their info on the Sole app for free, or have their fitness data be transferred to any of the following fitness apps (Fitbit, Record, Mapmyrun, Apple Health). 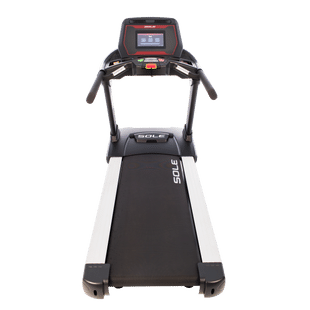 Convenient Controls - Users want to have the freedom of increasing speed and incline quickly, the display features quick speed/incline buttons along the sides of the LCD making it extremely convenient and easy to control and maintain your workout. 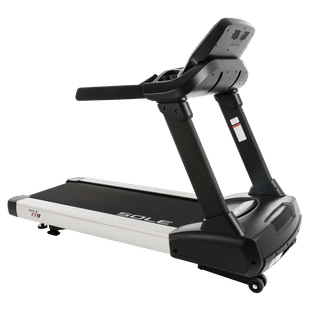 Cushion Flex Whisper Deck - A unique design to any type of treadmill on the market, this deck provides our users with a comfortable and quiet workout as well as reducing impact of up to 40%. The reversible deck is the same type used in Commercial grade models and is wax lubricated, which means less work on the motor during use. Precision Welded Frame - Accurate and precise welding is important when designing a treadmill. Durability of a product begins with a strong frame, capable of handling multiple users of various weights and heights. Large Light Commercial Display Screen - The SOLE display makes work outs easier and more effective. Sole touts three different displays depending on the SKU, a vibrant white back-lit screen, a 10.1" TFT LCD or a 10" Touchscreen. All of them offer large clean readouts provide users with helpful information, such as Heart Rate, Speed, Pace, Calories burned and many other useful bits of information. Message Board - SOLE is proud to offer integrated message boards on most of our models. What is the SOLE Message Board; it is an alphanumeric text center that sends scrolling messages to the user in an effort to guide them through all of the details of every workout. Ever wonder how to set up the user profile workout, just push the user profile button the message board will walk you through the rest. Think of the message board as having someone standing next to you reading from the owner's manual on what to do next in just about every function of the treadmill. After years of seeing people get frustrated in the gym and at home we came up with a better way to help you use the full capabilities of our treadmills, and we made is very user friendly. The message board will also recap your entire workout after you are finished, so you can see your progress. High Torque Motors with Flywheels- All SOLE treadmills feature the heaviest duty chassis and motors in their class. Beginning with powder coated all-steel welded frames and heavy duty stable inclines, we add industrial quality motors with large diameter, all-steel zinc coated balanced flywheels for a vibration-free secure running/walking surface. Why do we add a flywheel to our motors? Flywheels cause the motor to run cooler with less amp draw and extend the life off the motor. They also allow us to offer a start speed of .5mph of 1mph. 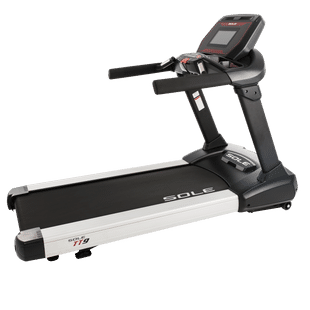 SOLE also uses much heavier flywheels than its competitors which give you the fluid motion you're accustomed to at the gym or on treadmill costing thousands more. Rollers- When we chose the rollers for our treadmill line we went with only the best and outfitted all of our treadmills with the same high-end rollers that most people only offer on $5000 treadmills. We use large rollers with a sealed bearing design and copper ground wires for each roller to reduce static. Larger rollers make for a larger contact surface against the belt and longer roller and belt life. This makes for smooth, quiet, static free motion that will stand the test of time. Belts- We use double woven 2-ply belts with four layers on almost all of our treadmills. Two rubber layers over a middle PVC layer with a nylon backing that rolls over the deck and rollers. The rubber provides the durability, the PVC stops the belt from over-stretching and the nylon provides a smooth static free surface to glide over the deck and rollers.